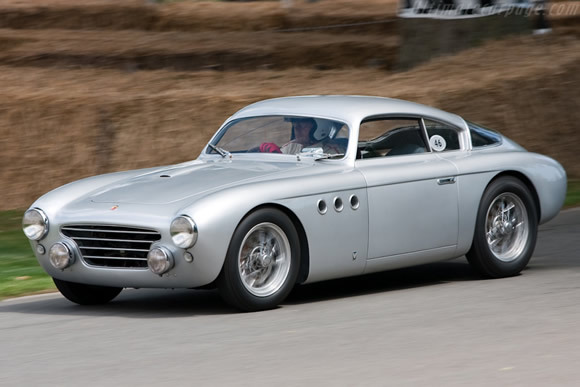 Abarth is one of my favourite tuners and this car makes up a big part of it's history being one of the first cars badged as an Abarth after Carlo Abarth left Cisitalia. The cars were tube framed and had an 1089cc four cylinder that with a bespoke Abarth exhaust and twin Webers produced 83bhp. Like most car manufacturers of the day the engines were sourced from Fiat. It's great that all three of the 205's have survived and this photo of chassis number 205102 was taken at the 2009 Goodwood Festival of Speed. Brilliant to see this beautiful car being raced and not stored away. I'm a bit disappointed the current owner 'rectified' the previous owner famous Swiss racer Helmut Fischer's modifications. Fischer modified the nose, fitted the car with an Alfa Romeo 1300cc engine, changed the interior and painted the car Green. With the success it had in that configuration, the history and the patina it would have had it would be a cooler car left as it was.